I was asked to give a presentation on how I encourage and teach through failure. My initial reaction was not to do so. When asked what was holding me back, I thought, what if I messed it up… How ironic! This summer at Maine College of Art, I took a class about working with new technologies and how they can be used as tools in the visual arts. What I came away with was not a vast knowledge of computer-aided design nor a comprehensive understanding of the software programs, but instead a greater empathy for what our students sometimes feel when faced with learning something new or getting outside their comfort zone. Through a collaboration with Bennett and several other art teachers we figured out that we needed to turn off the spinning function of the router so we wouldn’t get sprayed with ink. When I wanted a variable thickness to the line Bennett suggested we alter the path speed, and so on. This is how new ideas and techniques are generated, through trial and error. One of the things that students learn early on in my classes is that there are many ways (and techniques) to do something. I believe that the best art, design, and teaching come from people who embrace their ability to be flexible, adaptable, and vulnerable. I approach all of my work with a speculative curiosity and live for problem-solving and empirical learning. This is how I work alongside my students in class. For those of you who have not visited the arts classes I encourage you to do so at some point, and you will see this collaboration in action, not just in my classroom but others as well. I believe that to become proficient at making art, or anything for that matter, you need to push yourself to the point of failure to be able to learn from your mistakes. When working with clay a student needs to know and understand the material before they can make something. I remember one time when I was in my studio in graduate school and I was working on the potter’s wheel making a series of pots. My girlfriend, now my wife, Diane was watching me work on one pot after another. She would say, “that’s good, that’s enough.” Ignoring her advice, and one pot after another, I would push the clay to the point of collapse. This was my way of understanding the limitations of the material so the next time I made a vase I would know when to stop. It is this type of hands-on approach to a material that I teach to my students. I incorporate many techniques and styles into my demonstrations. 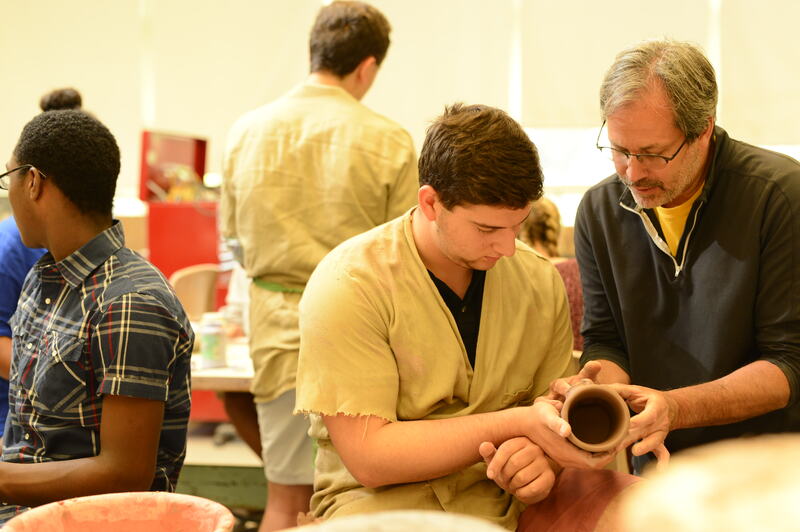 For example, in one of my Advanced Ceramics classes you will regularly see me ask my students questions about their project rather than give them the solution. The solution I might offer up may not be the only way to do something. Instead when a student asked if she should put a handle on her piece, my answer was “Where would you put it?” Because I answered her in this way, it prompted a conversation about balance, which led to discussing options on “how” to attach a handle. I try to lead my students through a list of educational and artistic questions that they answer for themselves, thus instructing them to revisit and enhance the techniques they have learned. I am also encouraging them to take full ownership of their artistic work, rather than simply telling them how I would create the piece. In my Advanced Ceramics class, this does not mean that I simply sit back and watch students grasp at straws as they tackle new projects. What it does mean is that I carefully demonstrate the techniques or methods for students to work on — ones that might not have only one possible approach. I then give them the space and the skills to work through the challenge and reflect on their process and struggles as they go. Powerful learning occurs when people have to struggle through challenging material and have the opportunity to fail a few times along the way. My interest in focusing on this type of productive struggle in my class comes from a strong belief that people learn more when allowed to fail than when provided all the answers. This type of learning forces us to put ourselves and our ideas out there in front of everyone, becoming vulnerable—Just like I felt in that workshop in Maine. One of the things that I do to try and make my students feel more comfortable is to do my own work right along with them in the classroom. This approach to my teaching has enabled my students to see me fail! I encourage my students to experiment, and not be afraid if they do not succeed at first. I remember so clearly when I was working on one of my pots in the studio and I was trying to lighten the form by carving away some clay, I went too far and carved through the base of the pot, but I noticed the tool that I was using left a neat pattern in the surface of the clay. It was this accidental discovery that led to the texture and surface carving I do in my work today. It started as a mistake that I took one-step further. I always refer to these as “happy mistakes” to my students. Taking risks can often improve one’s creativity. Taking a risk and going outside your comfort zone knowing that you may fail with your artwork is how new ideas are generated. I read an article from the Washington Post about a teacher who told her students that failure is not an option, it’s a requirement. Too often teachers are told that all material must be “scaffolded” for students. While in the classroom, it is sometimes taken to mean that all material must be broken down into such small and simple steps or chunks of information that students are all able to be successful every step of the way. If a significant number of students in a class are not able to immediately find the answer, this is often seen as an indication that the teacher did something wrong either in presenting or breaking down the material. Students, as a result, often get the message from very early on in their education that if they do not immediately grasp how to solve a problem or get the right answer, they must not be very smart or good at that particular subject. With years of training in this way of thinking, it comes as no surprise that students often respond to challenging work by either immediately asking the teacher for help or by giving up. My main concern with this approach to teaching and learning is that it simply is not authentic to either the practice of art or just about anything else in life. Most real-world problems are complex and do not come with clear steps to follow to reach a solution. If we are not equipping students with the skills to tackle such problems by supporting them in struggling with challenging work in our classrooms now, then we are simply pushing the issue farther down the road when students will come up against bigger challenges in future classes, in college, or in their careers. Providing our students with the confidence and skills to approach challenging work without an overwhelming fear of failure, and the mindset to see the failures they will have as opportunities to learn something is far more important and transferable than any set of facts we could teach them. Another aspect of my teaching has been building my students’ group work and process skills so that they develop their abilities to collaborate, try multiple approaches, and reevaluate an approach that is not working. In my Sculpture class I usually assign a group project in the last term. I introduced the project to the students and let them run with their ideas. Students are assigned to small groups and allowed to brainstorm their ideas for the sculpture. Each group then has to submit their design proposal, just like a professional artist would when applying for a commission. Selected faculty and staff members serve as jurors on the design committee. Once the design is selected, the project becomes more challenging. The entire class works together to solve problems of balance, construction, and cost. Working in smaller groups, based on each students particular skillset or talents, the fabrication process begins with delegation of responsibilities. All this is student run, with only gentle nudging or guidelines from me. This project enables my students to put into action all the skills, techniques and methods that were taught in the first two terms. I provide them with opportunities before and after each significant group work activity to reflect on how their skills are growing. As they are working, I have to be continuously mindful of my tendency to step in and redirect groups that are taking unexpected approaches. When I step back and allow my students to work through these problem-solving issues the most interesting student learning and work products have usually come from those groups. While all of us at some point in our lives experienced the discomfort that can come with struggle, we’ve hopefully experienced the investment in solving challenging problems, the “light bulb moments”, and the deep learning that comes with struggle as well. I have already seen the value in tilting my classroom more towards one focused on the skills of tackling complex questions. That of course does not mean that content does not matter, but simply that it does not exist in a vacuum away from the struggles and challenges that helped people discover it. If I want my students to tackle some of the big questions in art (or science, or math, or history, or anything), they need to be prepared to approach complex and challenging issues and to learn from their failures. So, in the end I am glad I put myself outside of my comfort zone to tell you how I feel about teaching art.